We have totally revamped the shipment list page based on feedback we heard from users just like you. We give you the option to toggle between old and new until December 31st when we move everyone over to the new format. This new list gives you a birds eye view of your shipments still-- but we give you more detail. You can see your carrier, pickup date, estimated/actual delivery date, invoice amount and a tracking status bar, and more. Hover over a shipment and see the latest tracking update will appear. Expand even further to see tracking details, shipments notes, and even share the shipment directly from your shipment list. 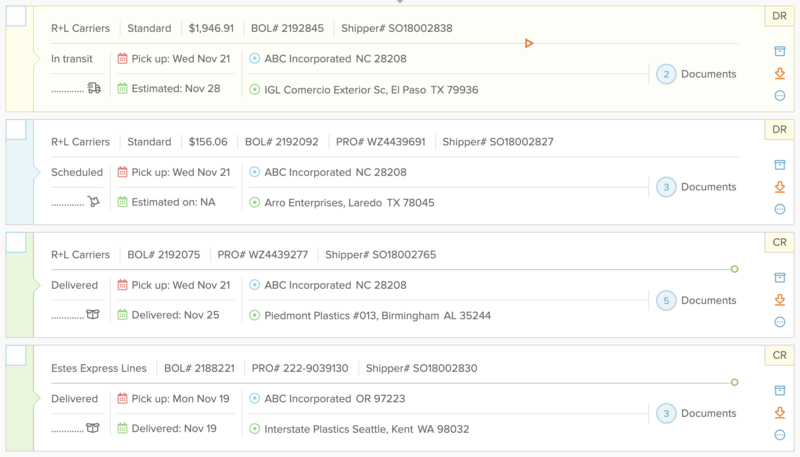 Easily see what kind shipment you’re looking at by hovering over the letters in the top right: direct rate, customer routed, spot quote, or a manual quote entry. You can still individually or mass archive by using the checkboxes or the archive button. Your shipment filters and export will still function exactly the same. Not a Freightview user yet? Gain visibility to all of your shipments and sign up for a free trial today.